Italian manufacturer of alcoholic beverages based in Novara in 1860 by Gaspare Campari. In 1842, at the age of 14 years, Gaspare Campari was working in "Caffè liquoreria Bass" in Turin, Italy. The work is transformed into a passion, and he quickly learns how to distill experimenting with new teas. He shares his days at the coffee shop with fellow Aragno and Martini: together will mark the habits of Italian drinking. Aragno will open a cafe in Rome, in front of Palazzo Chigi, while Martini will become a major producer of Vermouth. In 1860, now an expert distiller, he moved to Novara and opens the "Caffè dell’amicizia" (Coffee of friendship). Here begins the production of the first liquors labeled with his name: “Olio di Rhum” (Oil of Rhum), “Elisir di lunga vita” (Elixir of long life) and “Rosa Campari” (Rose Campari). It's the debut of “Fabbrica di Campari Gaspare Liquorista” (Factory Gaspare Campari liqueur). Between 1862 and 1867, in the gallery of Milan, he create the “Bitter all’uso d’Hollanda” (Bitter at use of Hollanda). The immediate success baptizes the new drink with the name of the inventor: born "Campari Bitter". Today Campari is no longer simply the namesake liquor manufacturer, but has turned into the Campari Group, one of the leading companies in the global beverage brand with over 40 brands of premium and super premium, which distributes more than 190 Countries around the world. 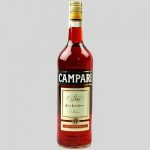 The brands in possession of the Campari Group are: American Honey; Aperol; Aperol soda; Biancosarti; Cabo Wabo; ovviamente Campari e Campari soda; Carolans; Cinzano; Cinzano soda; Cynar; Diesus Amaro del Frate; Dreher; Dreher Gold; Drury's; Espolon; Frangelico; Glen Grant; Gregson's; Irish Mist; Jean-Marc XO Vodka; Old Eight; Old Smuggler; Ouzo12; Punch Barbieri; Rum des Antilles; SKYY Vodka; SKYY Infusions; SKYY90; X-Rated; Wild Turkey; Zedda Piras; Ready to Drink - Campari Mixx; Ready to Drink -SKYY Blue.